A weekly newspaper’s souvenir final edition was the most retweeted newspaper front page of 2014, it has emerged. The Twitter account @regionalfronts which showcases regional press front pages has announced its top three most retweeted splashes from all of those posted on its page throughout the year. 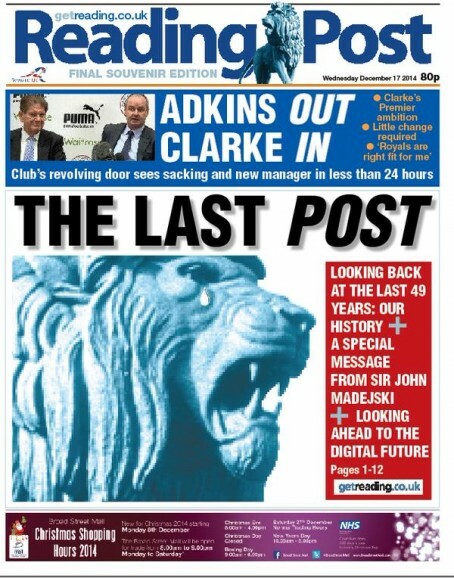 Top spot went to the final souvenir edition of the Reading Post, which ran with the headline ‘The Last Post’ prior to its closure last month. Its final edition hit the streets on 17 December after Trinity Mirror closed the 49-year-old title along with sister paper GetReading and five others across the south of England. The second most retweeted front page of the year went to Newcastle-based title The Journal and Darlington-based rival The Northern Echo, which issued identical splashes on 19 September in the wake of Scotland voting no to independence. Under the headline ‘Now what is your vow for the North?’, the dailies set out the case for a fairer deal for the North of England following the referendum. In third place came the Carmarthen Journal’s ‘Spaceship stole my sheep’ front from July, which revealed a farmer on the Welsh weekly’s patch had phoned police to report a UFO had stolen one of his flock. Neil Johnston and Fiona Parker, who run the page, said: “There were some really great front pages in 2014 and we wanted to show off some of the best. “The Tour de France editions from the North East were particularly impressive and we hope it highlighted that a lot of the best stories start out in the regionals. “For regional papers which are not sold outside their areas, retweeting front pages can be a great way of getting campaigns and messages across. “It’s also great to see other regional journalists sharing fronts which aren’t necessarily from their papers.